The book was written and compiled in Persian in 1021 H, when the Mughal Empire was at the apex of its glory in India. It was translated into English by Dr. Imam Din of Dacca University and in Urdu by Dr. Mohammad Bashir of the Punjab University. The under review edition is the latter. In his early age, Niamatullah lived an obscure life. In 993 H, he was the Chief Conservator of the library of Sipah Salar Abdul Rahim Khan-e-Khanan until 1006 when he joined the retinue of Prince Saleem. In 1014 H, when the prince ascended the throne and adopted the title of Jehangir, he appointed Niamat Heravi as the court-chronicler. In 1017 H, Emperor Jehangir dismissed him from the service for some sort of misdemeanour. Then he joined the service of an Afghan Amir Mian Pir Khan alias Khan Jehan Lodhi who had crushed Marhatta uprisings against the Mughal throne in Southern India through a series of battles in1019. Niamatullah Heravi took part in all those battles. In Deccan, he commenced compilation of the history at Malakpur on 20 Zilhaj 1020 and concluded it at Burhanpur on 10 Zilhaj 1021. Later, in 1024, he added to it the biography of Khan Jehan Lodhi and also mentioned the death of Sheikh Shahab Bakhtiar which occurred on 25 Jamad-ul-Akhir the same year. The book also contains material on the struggle for power between Aurangzeb Alamgir and his brother Dara Shukoh in 1067, in which the former succeeded to grab the throne. However, the author omitted the events related the revolution of Khan Jehan against Emperor Shah Jehan, in which the former lost his life. This leads the translator, Dr. Bashir, to confusion about the death of the author. He draws his own conclusion that since the author had developed some sort of difference with Khan Jehan Lodhi and lived in recluse, he had purposely omitted the events related to abortive revolution by Khan Jehan Lodhi. If we analyse the account presented by Dr. Bashir, the Chief Conservator of the library of a man like Khan-e-Khanan must be a matured learned man in forties. So, the year of birth of Niamat could be around 95, and, in 1040, he was an octogenarian if he still lived, and in 1067 more than 110. So, it can be assumed with reservation that Niamat Heravi died before 1040 and the events of later stage were added to his work by someone else. His father, Habibullah Khan Heravi, lived in India in service of the Mughal Empire. It is, therefore, believed that Niamatullah was born at Agra or somewhere else in India. The fifth, and the last, appendix gives an introduction of Haibat Khan and his dedication to Khwaja Yahya Kabir, an Afghan Saint, who spoke Pashto. It gives an idea that the author enjoyed a good opportunity of reading and recording of day to day events at the court of Emperor Jehangir by virtue of his employment, which needed, of course, scholastic knowledge and good command on languages. But, he left no other work except the one under review, who which he was also inspired by Haibat Khan and Khan Jehan Lodhi. The motivation behind this work was ethical and biased. He was supposed to write something to aggrandise the Afghans as a nation and boost up their morale. But, he did not hide his fear of the Mughal power that reflected its cruel nature. He tried to balance his approach to both the rival forces, which, noticeably, led him to confuse the issue. His fear of the Mughal power is reflected in the titled he used for the Emperors and avoiding of mention of their names repeatedly. Babar has been titled as Firdaus-e-Makani, Humayun as Janat Ashyani and Akbar as Arsh Ashyani and so on. Looking through his experience, his language was not so fluent and rich, which is a common phenomenon if one writes in hesitation under some pressure or compulsion. In his preface, Niamatullah Heravi, having used the prefix of Khwaja, has given his biography, the purport of his work, the bibliography and has also summarised the contents. It is followed by another preface, which gives genealogy of the mankind from Adam to Jacob, also giving ages of a few Prophets in the line. Then the book starts chapter-wise. Chapter No One gives the events to show as to who Saul was and how he became the first Israeli King with proclamation from Prophet Samuel. Saul fights Goliath, the strongest non-believer, who was killed by David the Prophet. Saul grudged against David and tried to kill him. But through a maiden saint, he established contact with dead Samuel, who suggested to him to abdicate in favour of David and then offer sacrifices of his sons and himself through Jihad against the non-believers for redemption. He did so. Then his two sons Armia and Barkhia, born after their father's and brothers' martyrdom, were appointed b David in his court. A son of Armia was named Afaghena - the forefather of the Afghans. The descendants of Armia, through Afaghena, were driven out of Babylonia. A part of them took refuge in the central parts of present Afghanistan, which are now known as Ghore. When Khalid bin Waleed, who himself related to that family, embraced Islam, he invited his kinsmen from Ghore. Led by Qais, they went to Mecca and were introduced to Prophet Mohammad (PBUH) by Khalid. They also embraced Islam and then participated in Jihad. Qais was given the name of Abdul Rashid. From Adam to Qais Abdul Rashid, the events and genealogy have been covered in two chapters and one preface, which have been summed up in the preceding paragraph. It, however, needs some clarification. More or less similar line has been taken by other scholars also and still a number of interested writers rely on their information. But little is known about the primary source of the information, and none of the scholars has given any reference to it. Of late, certain Muslim scholars took notice of it and rejected this whole story as a fabrication of Jews. In 586 BC, when Nebuchadnezzar subdued Israelis and destroyed the whole structure of their culture, having burnt their religious and other literatures including the original Torah, the Israelis were so much depressed that they lost all hopes of their survival. The Jews rabbis and scholars realised the hanging threat of their total annihilation. They worked devotedly to prepare a sacred book, later titled as the Old Testament, in order to boost up the morale of their people. One part of this book deals with the evolution of God, creation of Adam and then Adam's posterity in a line, which has been, almost, copied in Makhzan-e-Afghani. The Pakhtun writers, commonly, refer to the lost ten tribes and try to prove that they had migrated to central parts of Afghanistan. But by that time, the Central Asia, including Afghanistan had already seen a sequence of changes and development of a sort of civilisation, which is elaborated by sociologists in different ways. So this theory is falsified by the history, when we see the Persian Empire expanded with glorious civilisation, its language and culture, and religion (Zoroastrianism) and the area was then called Sogdiana. The Muslim scholars take the Holy Koran as the source of information. The Holy Koran describes the creation of Adam and depicted his life in the Paradise and then his ouster from the Paradise. It mentions a number of Prophets for very significant events. The Muslim scholars, down to Maulana Maudoodi, although having slight variations in interpretation of these events, have reject the stories, which do not coincide with those mentioned in the Holy Koran and Ahadees, or with the well founded historical facts. Chapter III deals with Lodhi dynasty in three parts: (a) Behlol Lodhi, (b) Sikandar Lodhi and(c) Ibrahim Lodhi with a passing reference to the victory of Babar over Ibrahim at Panipat, which was, in fact, a turning point in the history of India to usher in a new era with the Mughal Empire. Chapter IV discusses the period of Suri dynasty in four parts: (a) Sher Shah Sure, (b) Islam Shah Suri, (c) Feroz Shah Suri and (d) return of Humayun, and short notes on some Afghan Sardars. These two chapters have been copied from Tabqat-e-Akbari compiled by Mizam-ud-Din, although it has not been indicated by the author. 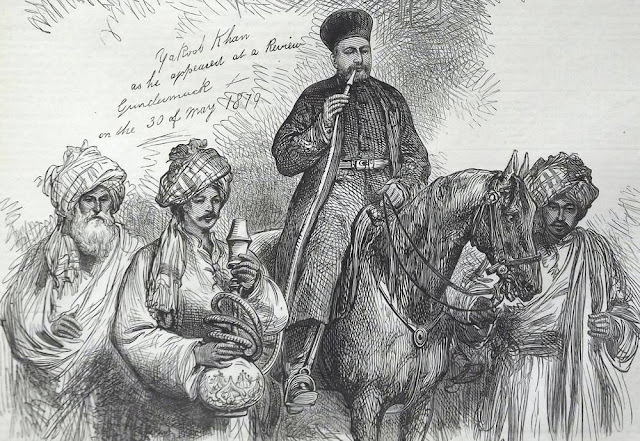 Chapter V on Nawab Khan Jehan Lodhi was added later as the sole purpose of the book was to magnify the character of the benefactor of the author, who was so much interested in the history of the Afghans. This chapter has been divided into five parts. As a fashion, the Nawab has been named after a long row of titles. He is put in the same lineage of Bani Israel. Chapter VI explains the Afghan families in fourth parts: (a) Sarbani, (b) Bitani, (c) Ghorghashti and (d) Karlani, which are repeated more or less in the same pattern by most of the Pakhtun writers. Chapter VII has been dedicated to Emperor Jehangir with all the benevolent praises in his favour, so much so that the weight of the chain linked with the gong for appellants, under the orders of Jehangir, has been shown as 489 maunds instead of four maunds. And this is the end of the book. After the end, start the biographical sketches of the Afghan saints, 66 males and five females. This has also been divided into parts: 1-28 are Sarbani, 29-48 are Bitani and 49-66 are Ghorghashti, the rest 67-71 are females. These are quite interesting and gives an idea, if not complete picture, as regards the contribution made by the Afghan saints to propagation of Islam in India. It is followed by five addenda to give some more genealogies of the Afghan families, the last one speaks of Haibat Khan and Khwaja Yahya Kabir, which is, probably, the writing of Haibat Khan. The honoured translator has added five valuable indices of the names of persons, places, quotations from the Holy Koran and bibliography, and corrigenda. These have seized a hundred pagers. In the last, there are eight genealogical trees of the Afghan families stemming from Qais Abdul Rashid. But there is no mention of any other person contemporary of Qais Abdul Rashid. Here, the question arises; where have gone other people of the lost ten tribes, and where and who are their descendants? Throughout the book, there are serial numbers in brackets at intervals. It has not been explained anywhere, but its shows that these numbers denote the pagers of the original work from which it has been translated. In the text, Persian verses have been quoted, and, at certain places, Urdu translation of some quotations has been given, which were of Pashto verses as indicated by the translator. There are certain glaring mistakes in the chronology, which have been pointed out in the margin. With all its drawbacks, the book is considered as one of the best works in the Mughal period. It has a standard and is lays down a system in its approach to the rise and growth of the Afghans in India. However, the theory of the origin of the Afghans is open to question.